Ask fellow campers about "LVM Resort" and nearby attractions. Gated park with guard, expensive but worth the money. Very clean, well landscaped, great pool area and fitness area. Large sites some with built in grills etc. Close to the interstate for easy access to shopping and the Strip. We camped at LVM Resort in a Motorhome. Make sure you check out Red Rock Canyon, about 15 miles from the park. Incredible scenery and great hikes. We have stayed at this facility many times. Over the years the foliage has grown in nicely and it's become an even nicer park. The addition of Pickleball is a nice touch as well. Excellent resort style restrooms at all remote pools. Excellent resort style swimming pools throughout the resort. We camped at LVM Resort in a Motorhome. The on-site (at the entrance) diner (restaurant) is very good; however the portions are a little on the big side. Very easy access to nearby Target, Safeway stores etc. off Blue Diamond Road. Very easy access to local casinos and hundreds of good restaurants. Without question the best RV Resort/park in the Las Vegas area. Tons of sites, lots of swimming pools, even a decent restaurant at the entrance to the facility. Excellent power, good WiFi, decent amount of room between sites. Apparently well managed. Our rig is 45 foot long. We camped at LVM Resort in a Motorhome. So many good restaurants in this city it's hard to name them all. Try Hugo's Cellar in the 'old' downtown Vegas. Making a huge comeback. Take a cab to old downtown and walk the 'car free zone'. It'll take you back 40 years! Try Mama's Hash House on Sahara/Decatur. Local place. Unbelievable home made hash. This is a very nice RV Resort, but from the last time we where here 2 years ago it has gone a little down hill. The sites are large and very private, with the hooks up in the perfect place. We did not notice any airport noise as others have noted. We where only there one night and for an extend stay it would be ideal, it is the best park in LV. It is only for motorhomes. Because we where just overnighters we had a plan site but it was still very nice. We camped at LVM Resort in a Motorhome. Our favorite casino is South Point and both restaurant are very good. My husband and I have been full time for 2 years. We have visited all 48 continental states. This is the most luxurious park we have ever stayed in. We have been here two years apart. It has everything! Each site is VERY private & immaculate. 5 pools, 6 spas, 5 restrooms, 5 laundries, gym, party room, dog park, restaurant. It's awesome. Big, but private. We camped at LVM Resort in a Motorhome. (The $81 price was for a premier site.) There is nothing we could find lacking in this park. It is truly a resort feel, with lush landscaping, several pools, immaculate look, etc. It is located in a residential area and is very quiet, yet we were a 10 minute drive to the big casinos on the Strip. We would highly recommend this park to anyone. We camped at LVM Resort in a Motorhome. Rather than repeat all the past reviews, I will try to add some additional information. We used the weight room facilities often during our week stay. The room was always clean and organized, the fans were on, and the TV was functional and available. The temp in the room could have been a bit cooler, but it was tolerable. The grounds crew was always busy keeping the grounds looking sharp. We did find the gate guards inconsistent though. We had various visitors during our stay, and some guards would make the guest call us for permission to allow them entry, and others would just wave them through. The only real negative about the park is the always present jet noise from the planes taking off and landing at McCarran airport. I will stay here again. We camped at LVM Resort in a Motorhome. Best park we have ever stayed in. Wonderful landscaping, 4 pools, lots of peaceful, paved streets to walk on. The restrooms at each of the pool areas were nice - actually only went to 2 of them though. Wonderful clubhouse and exercise room. The lots were lovely and ours had wonderful outdoor furniture and tiki style umbrellas. All hook-ups worked fine. We enjoyed looking at the sites that have the built-out kitchens. We will be back. There is airplane noise but we enjoyed watching the variety of planes fly over. We camped at LVM Resort in a Motorhome. This is the Ritz-Carlton of RV resorts. We had a premium improved site for a week, and then extended for five more days in an unimproved site. The only reason I didn't give it a "10" is because of airplane noise. The resort is about a mile or so west of the landing pattern for the Vegas airport. Depending on the winds, the noise can sometimes be loud and unrelenting. I was awakened more than once before six a.m. by jet noise. We camped at LVM Resort in a Motorhome. Excellent resort - peaceful, well landscaped, very friendly staff and residents, quick access to the strip. This is a relatively large, gated ownership resort with approximately 75% of the sites sold (they did not push on buying a lot). All sites are concrete backins with privacy barriers (hedges mostly) between each site. Plenty of room for 37' coach with toad parked in front of the coach. Ownership sites in the rental pool have upgraded amenities (at an upgraded price). Five pool / hot tub / shower / laundry areas distributed across the resort. Last time was very quiet (we were on an inner space), this time was a bit louder but still relatively quiet as we were on an exterior site. Power ok, water 65psi, sewer ok. They have recently replaced their Tengo internet (which was stable and fast for a Tengo connection) with LV.net. iPhone, iPad, and Android phone could not see the network when more than 6 spaces from the tower. Router with high gain antennae never managed to get connected in a week despite repeated calls to LV.net. Decent Verizon signal strength and data speed. We will stay here again when in the Las Vegas area. We camped at LVM Resort in a Motorhome. I'm more the "Not exactly roughing it" sort. But when we pulled up to LVM, I was very content to hang here for the 3 days we did while he was at a convention. It's actually the best park we've ever stayed in. Wonderful landscaping, 4 pools, lots of peaceful, paved streets to walk on and I loved how, if we ever returned, we could have a lot with a peaceful patio/outdoor kitchen setup. If only I liked Las Vegas (which I do not at all), I'd love to return. Put a LVM in Scottsdale and I'm there! We camped at LVM Resort in a Motorhome. This is a Class A MH only park just off of the strip in Vegas. Everything is top notch as many of the sites are owned and then rented by the park office. The only negative for us on this visit was that the site we had was a bit narrow with the slide extended, but still had sufficient room to hang around outside. The pool and workout room are very nice, as well as the hot tub and meeting room facilities. I will stay here again. We camped at LVM Resort in a Motorhome. It is always a pleasure to return to LVM Resort. The streets are wide, the flowers are blooming and the grass is green. The pools are sparkling. Personnel is friendly & helpful and makes you feel welcome. It is short drive to the Strip or a quicker drive to Silverton Casino for fun. The on-site diner has great breakfasts at reasonable prices. 24 hour security. It is well worth the price. We camped at LVM Resort in a Motorhome. Beautiful ownership park. Great for a getaway or to enjoy Las Vegas. Free wifi is slow and Verizon is surprisingly just 3G. Easy access, level sites, very pleasant. We camped at LVM Resort in a Motorhome. This is one of, if not the finest RV resorts we have ever stayed at. From the courteous office staff to the on-site diner, the resort is well equipped and clean. There are 5 pools, a complete gym/exercise facility, showers, laundry sites, daily trash p/u, wifi (soon to be upgraded to the fastest available anywhere), tennis courts, a 9 hole golf putting course, pet area plus numerous events where guests are welcome. Overall an excellent location, close to the strip and the many other attractions of this area. Special rates for vets and other discounts. We camped at LVM Resort in a Motorhome. Target & Albertsons are 1 minute away! The diner has good food at reasonable prices. Grimaldi's pizza is a chain that offers excellent pizza and very large salads. They offer white pizza which is a must for my wife. Also found an Italian restaurant (Spaghetty Western) that was excellent with Italian waiters and music. Wonderful place to bike or walk around. Shopping and food very close by. We didn't have any reason to leave the site. The dinner at the entrance is good and well priced. We like South Point both the Italian and Steak restaurant are excellent with big portions (we always split our meal). The casino is mostly locals or cowboys so a lot of fun. Had our coach washed and waxed by "To Your Door Detailing" by far the best detail we have had. The park has no ice at all. You have to go to the main street and buy ice at a Target store. Traffic on this street is terrible. If you are new, ask when you call about the kind of sites. The important thing in the warm weather is NOT facing South or West, due to the sun. Remember they are back-in sites, so it's the way your windshield faces when you park. I used to live in Las Vegas. My best tip: the entire city is full of fantastic restaurants that are equivalent to or even better than the ones on the strip. But they are MUCH cheaper. So don't eat on the strip and don't freak out if Yelp sends you to a high rated restaurant in a strip mall in some remote suburb. For example, there's a great Hawaiian "plate lunch" restaurant about a block from the park. High quality, generous portions, at an affordable price. You are in Vegas. You know what to do. Ask for an east-facing site. This will help you avoid the hot sun. All kinds of shopping at your fingertips. Diner at park entrance was excellent for breakfast. Staff gives 10% coupon for it at checkin. Only 8-10 minutes from Strip. Must see: Red Rock Canyon, Lion Habitat, & Hoover Dam. The location of the resort is very convenient for visiting Las Vegas and the surrounding area. A day trip out to Red Rock Canyon is well worth the drive. There is a TA just before you get to the Highway Ramp. Very easy 10-15 minutes to get to the Strip or shopping. Very easy access to the freeway but far enough away that you cannot hear any traffic noise. 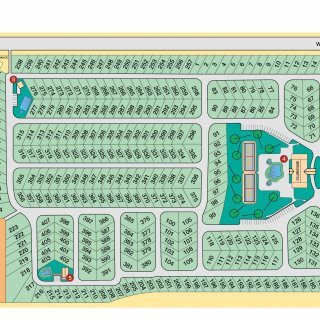 Be sure to get a map of the resort as the streets are not marked and with around 400 lots it's easy to get lost when walking around. Well, its Las Vegas so there is plenty to do. We had Lazy Days Motorcoach Detail come to wash our rig. It was absolutely the most thorough wash job we've ever had. Washed roof, coach, spot free rinse and towel dry for $100. Used soft mitts and not brushes. Had them come back another day and wax our roof. Centrally located to Strip (10 minutes) and very safe location. There are stores conveniently located nearby including Target. You're close the freeway so it's easy to get around town. Einstein bagels is now nearby! Some hotels on the Strip are putting in the equipment to charge for parking. Visitors may want to check where free parking is still available before heading that way. We love South Point not so Vegas strip. The Italian and steak restaurants are well priced and good quality. Split a meal big portions while maintaining quality. Good Luck at the gaming!! The on-site (at the entrance) diner (restaurant) is very good; however the portions are a little on the big side. Very easy access to nearby Target, Safeway stores etc. off Blue Diamond Road. Very easy access to local casinos and hundreds of good restaurants. So many good restaurants in this city it's hard to name them all. Try Hugo's Cellar in the 'old' downtown Vegas. Making a huge comeback. Take a cab to old downtown and walk the 'car free zone'. It'll take you back 40 years! Try Mama's Hash House on Sahara/Decatur. Local place. Unbelievable home made hash. Are you affiliated with LVM Resort ?